wondering how to be a part of this? there are several ways to get involved. Have a pestering challenge that requires some creative input? Need a fresh perspective on old problems? Bring them to the playground!Bring Your Own Challenge (BYOC) is our program for industry and community partners to benefit from Habib’s intellectual and material resources. 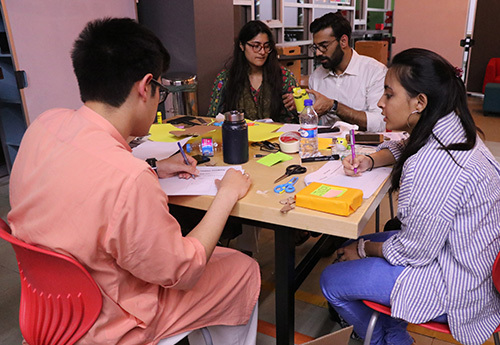 We help frame your problem into a Design Thinking challenge, and set up a multi-disciplinary team of faculty and students to crack it. Our students benefit from real world exposure. You benefit from our cutting-edge Design Thinking approach. Win Win. Empathize. Define. Ideate. Prototype. Experiment. These 5 steps are at the heart of our design thinking training boot camp. If you have a challenge that requires a creative insight and human centered approach, then playground is just the place for you! Identify and understand your client. We will share the right interviewing tools with you to engage with your audience. Help you frame your insights into an actionable problem statement and scope a meaningful challenge. Facilitate your team to transition from identifying challenges to effective, innovative and viable solutions by mapping and imagining alternate possibilities. 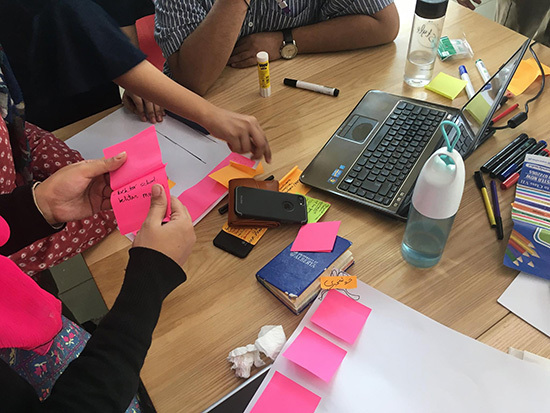 Prototype solutions to test, refine and to gain deeper end user insights. Get in touch with us at playground@habib.edu.pk and we will set up a time to meet with you and get the ball rolling! Curious to see Design Thinking in action? Want to tackle real world challenges using design and making? Come join us for workshops that offer the opportunity to examine, and tackle, curated and real world challenges. 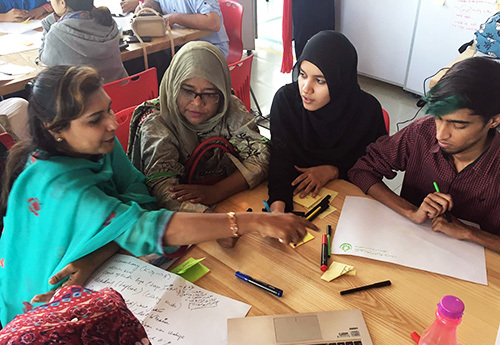 Workshops are organised through courses at Habib, with external design practitioners, or through challenges brought under the BYOC program. They can last from a few days to a few months, depending on the nature of the workshop. Interested in offering a workshop? Email us at playground@habib.edu.pk. PopUps are workshops for those constrained with time and commitment. They are the quickest way to immerse yourself into the playground, and explore the various design and making activities we offer. PopUps are for and by everyone. Students, faculty, staff (and sometimes external practitioners) offer and take part in these quick skill and knowledge exchanges. PopUps can vary from 2 hours to a couple of days. Have a great skill you want to share with others? Interested in offering a PopUp? Sign up through this form.